Legallly blind archer posts first world record of London Olympics. The first world records of the London 2012 Olympics have been set by a blind South Korean archer — hours before Friday’s much-anticipated opening ceremony was due to begin. 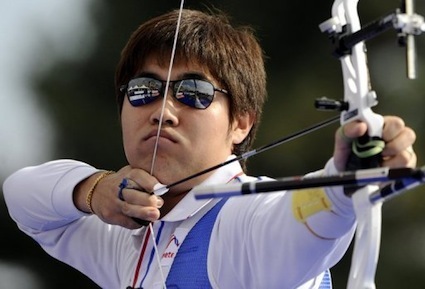 Im Dong Hyun is legally classified as blind and cannot see out of his right eye, but it did not stop the two-time gold medalist bettering his own leading 72-arrow score in the qualification competition at Lord’s cricket ground in the British capital. The 26-year-old, who struggles to read a newspaper, scored 699, which put him top of the standings ahead of compatriots Kim Bubmin and Oh Jin Hyek.